I recently had the pleasure of reading Alan J. Singer‘s, ‘New York and Slavery – time to teach the truth’ (published, 2008). This 166 page book deals with ways of engaging young people in the exploration, discussion and thinking of aspects of the history and present day consequences of North American slavery. 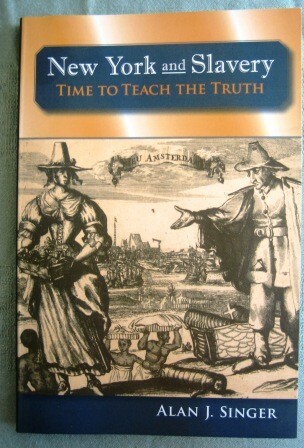 Although pitched at a New York audience it has relevance for all historians and teachers of history who agree that it is “time to tell the truth” and involve their pupils and students in constructivly challenging preconceptions and stereotypes that exist in the classroom and wider society around slavery and the trans-Atlantic slave trade. As one who has spent a lot of time, energy and research into the history of slavery and the results of slave labour from a Bristol/UK perspective, it is interesting that Singer (and his educational colleagues in NYC) are experiencing the same frustrations as many of us on this side of the Atlantic. His discussions about the lack of understanding by educational, institutional and public authorities regarding how ‘facts’ and ‘information’ can be interpreted differently by people of different backgrounds, ethnicity or colour is a mirror image of what is happening in the UK. The struggles in NYC to get flexibility in the History curriculum could have been written by a UK-based history teacher who really wants to engage his/her pupils in the vitality of social history in the classroom. I found the information on the early history of New York/New Amsterdam illuminating. This section provides an understanding of the ‘half slavery’ Africans endured under the Dutch and the complete, ‘chattle slavery’ introduced by the Penn family fiend, the Duke of York.